tal protection and social responsibility seriously. 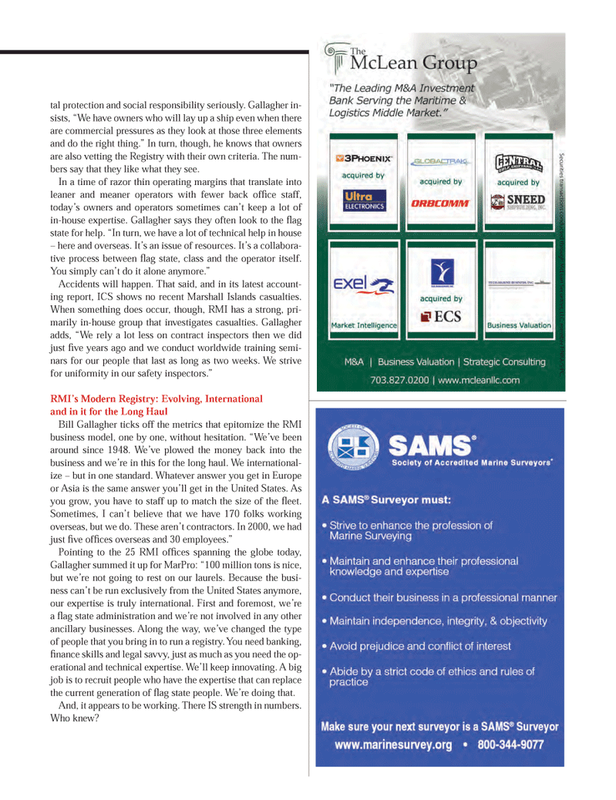 Gallagher in- sists, “We have owners who will lay up a ship even when there are commercial pressures as they look at those three elements and do the right thing.” In turn, though, he knows that owners are also vetting the Registry with their own criteria. The num- bers say that they like what they see. In a time of razor thin operating margins that translate into leaner and meaner operators with fewer back offi ce staff, today’s owners and operators sometimes can’t keep a lot of in-house expertise. Gallagher says they often look to the fl ag state for help. “In turn, we have a lot of technical help in house – here and overseas. It’s an issue of resources. It’s a collabora- tive process between fl ag state, class and the operator itself. Accidents will happen. That said, and in its latest account- ing report, ICS shows no recent Marshall Islands casualties. Bill Gallagher ticks off the metrics that epitomize the RMI business model, one by one, without hesitation. “We’ve been around since 1948. We’ve plowed the money back into the business and we’re in this for the long haul. We international- ize – but in one standard. Whatever answer you get in Europe or Asia is the same answer you’ll get in the United States. As you grow, you have to staff up to match the size of the fl eet. Gallagher summed it up for MarPro: “100 million tons is nice, but we’re not going to rest on our laurels. Because the busi- ness can’t be run exclusively from the United States anymore, our expertise is truly international. First and foremost, we’re a fl ag state administration and we’re not involved in any other ancillary businesses. Along the way, we’ve changed the type of people that you bring in to run a registry. You need banking, fi nance skills and legal savvy, just as much as you need the op- erational and technical expertise. We’ll keep innovating. A big job is to recruit people who have the expertise that can replace the current generation of fl ag state people. We’re doing that. And, it appears to be working. There IS strength in numbers.